First off – Don’t Do It. The ride itself is just not that great. Having said that – chances are, you’re not researching Rope Drop at Epcot for Frozen Ever After unless you have to. I understand – here’s a bit of information about our experience. Also, we learned of a few additional options for bypassing the attraction’s notoriously long wait times. Since opening at Epcot in 2016, Frozen Ever After became a “must-do” attraction, taking over the Norway pavilion’s former Maelstrom ride. Fans of Frozen flocked to the park to take in the attraction, instantly making the ride one of the most coveted Fast Pass selections in Epcot. 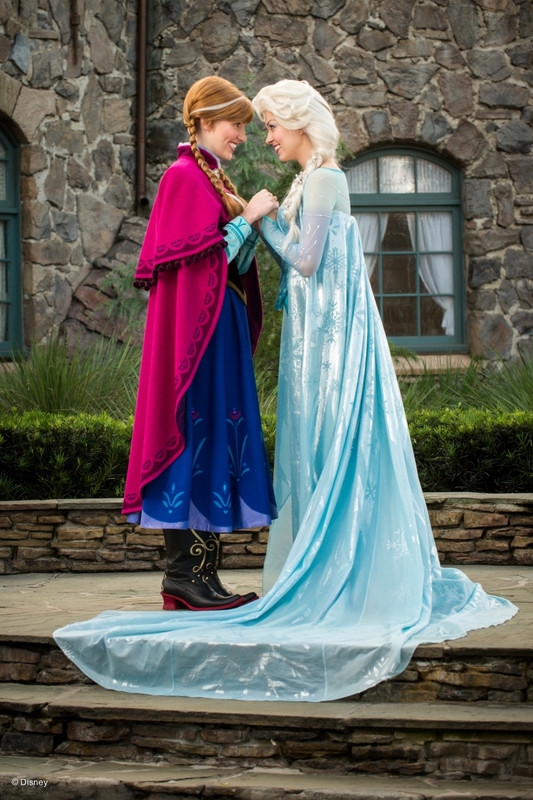 Anna and Elsa have also setup shop in the Norway pavilion for character meet & greets. In Epcot, Fast Passes are tiered, meaning you can only make one advance selection for Epcot’s top-rated rides (currently Frozen Ever After, Soarin’ and Test Track). Due to the tiering system and the number of people visiting Epcot for the primary goal of riding Frozen Ever After, it’s a very difficult Fast Pass to acquire without significant advance planning. There are many great Disney sites for plotting your day and maximizing your time. Every ride at Disney has multiple videos posted to YouTube, ride and trip reports, and even multiple sites that track wait times and fast pass availability. Enough that we created a separate post to help with your planning and you should check them out. This is simply our experience of Rope Drop at Epcot. Our experience was the week before Christmas 2017 on a day with a 9AM opening, no Extra Magic Hours. Park crowds were building toward the holiday break and crowd calendars for the day projected Epcot to be an 8 or 9 – meaning very busy. Our hotel – the Walt Disney World Swan – is located in the Disney Boardwalk area, convenient to both Epcot and Hollywood Studios via complimentary boat or walking path. Learn why the Swan & Dolphin sister properties could be excellent choices for your hotel stay. Epcot has two entrances – one at the front (facing the Epcot ball) where Disney bus and monorail transportation, as well as Epcot parking enter the park. Then there is a second, smaller entrance in the corner of World Showcase, near the bridge separating the United Kingdom and France pavilions. Guests staying in the Boardwalk area resorts usually enjoy easy access to this less-utilized entrance, which also has restrooms, guest services and a Disney gift shop near the entrance. If you’re not staying at a Boardwalk area resort, you could still try this entrance by either taking Disney transportation or car service to a Boardwalk area location. The Swan and Dolphin hotels also have daily self-parking and valet options for a fee. The Swan has a coffee bar with breakfast items and Starbucks coffee. Disney’s Boardwalk also offers a pastry shop with coffee and drink options. On a pleasant December morning, our stroll across the boardwalk to the International Gateway entrance is only 10 minutes. About 20 people are in the security area. A security officer is strolling around welcoming guests and advising of what to expect with the security check. Guests without bags can bypass the bag check stop and go through a scanner. A couple of Disney transportation boats from the Boardwalk area hotels arrive and lines form at the security queue. Within 15 minutes of our arrival, security begins checking bags and allowing guests to pass security checks and enter the park. In no time, we have walked into the back portion of Epcot where another line queues. From the International Gateway entrance, Frozen Ever After (in the Norway pavilion) is almost directly across the World Showcase and the most direct route would be taking a right toward France. However, the World Showcase (the countries in Epcot) area does not typically open until 11 AM, even though the Frozen Ever After attraction opens at 9 AM with the rest of the Future World attractions. Thus, lines queue just outside of the United Kingdom, not far from where Alice in Wonderland and Mary Poppins greet guests during the day. We are near the front of the line and within ten minutes, there are probably 200-300 people behind us. “Don’t Run!” they ask. Run they do. As soon as the “rope drops”, most guests walk at a brisk pace toward future world. Despite the requests, many guests run through the park to the early morning rides of choice. Groups tended to go in one of two directions – teens and older guests veered left at Future World and headed to Soarin’ while guests with younger children headed for Frozen Ever After. After being passed by one solo father in a full Olympic-style sprint, we made it a point to slow down and decided no grown man should lose their dignity over Frozen. Within a couple of minutes, we passed the speedy dad (now waiting for the rest of his group and unable to hold places) out of breath and out of line. Other blog posts with information on Rope Drop reported guests arriving at Epcot’s main entrance actually have a shorter distance to Norway, however, it was not a significant advantage on this day. I can only assume cast members coordinate what time to rope drop. Our ten minute walk put us in line just before 9 AM. Rides must have started just before 9 AM as our line moved quickly. In fact, we walked through so quickly, we didn’t get to experience much of the Frozen theming in the line queues. We boarded within 10 minutes and checked Frozen Ever After off our list by 9:15. As we left the ride, wait time was already up to 35 minutes and the lines were growing. During the remainder of our day, we never saw wait times under 60 minutes after the early morning start. The ride itself – not that great. In fact, it’s basically a repackaged version of the former Maelstrom ride, just now featuring Anna, Elsa, Sven and Olaf. However, mom and dads of Frozen fans won’t be able to win that argument. Enjoy a character breakfast with Disney Storybook Princesses. Securing a reservation as close to the first seating as possible (currently 8 AM, but subject to change). This gets you out of bed about the same time as our rope drop schedule, but with the added benefit of earlier park entrance with your dining reservation and breakfast. With a seating close to 8 AM, you should be in good position to finish your meal and be at the Frozen Ever After entrance right outside the restaurant very close to 9 AM. Another reservations required event, for $80 (adults) and $47 (ages 3-9), the Frozen Dessert party provides a reserved viewing area for Epcot’s Fireworks show, Illuminations, along with Frozen inspired sweets, drink options and more importantly, guaranteed rides on Frozen Ever After as the park is closing. Your motivation to ride Frozen Ever After at any cost will drive your interest in the option. Our Morning at Epcot: Frozen Ever After, Test Track, Garden Grill Breakfast, The Land (including Behind the Seeds tour), Soarin’ (Fast Pass). This plan freed us up for a mid-afternoon heavy snack and enjoyable time exploring the countries and the seasonal Candlelight Procession.